Oh, why do I fall for Horde armies? There are too many figures and take ages to paint! The third and fourth 60-strong units of skaven clanrats/slaves are coming along nicely. three figures are missing, 1 is the first test figure for the colour scheme, which is finished and not part of this batch. 2 lost an arm when being dipped and is being repaired and 3 got lost while dipping, it literally flew off the base and disappeared in the undergrowth outside my house where I was shaking the dipped figure. Quite annoying not being able to find it. Note to self: Always make sure the figures are glued properly before dip & shake! These need a dab of pink on the nose and in the ears before basing and matte varnish. Will be good to get them finished at last! 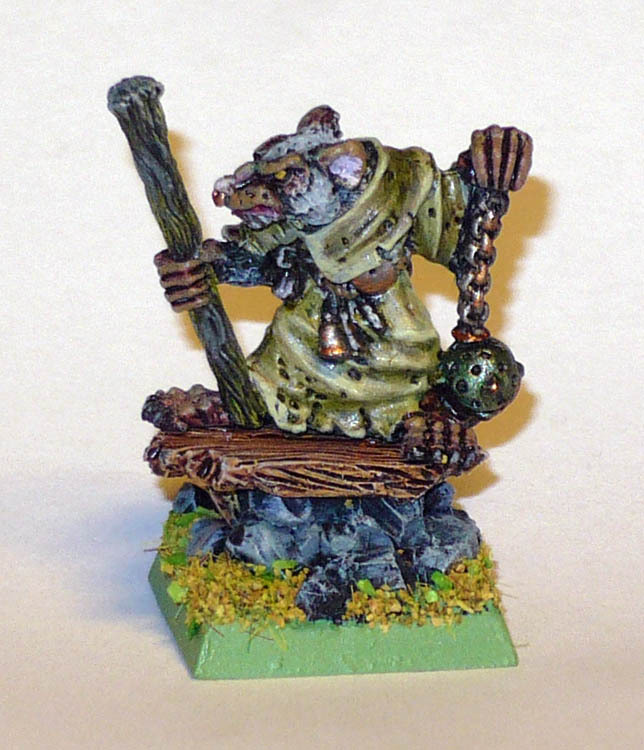 And old skaven plague priest (were they even called that then?) I will probably use it for a warlock. The base is a resin “Wyrdstone herobase” bought from the maker on ebay uk. These were even better quality than expected. Top notch.